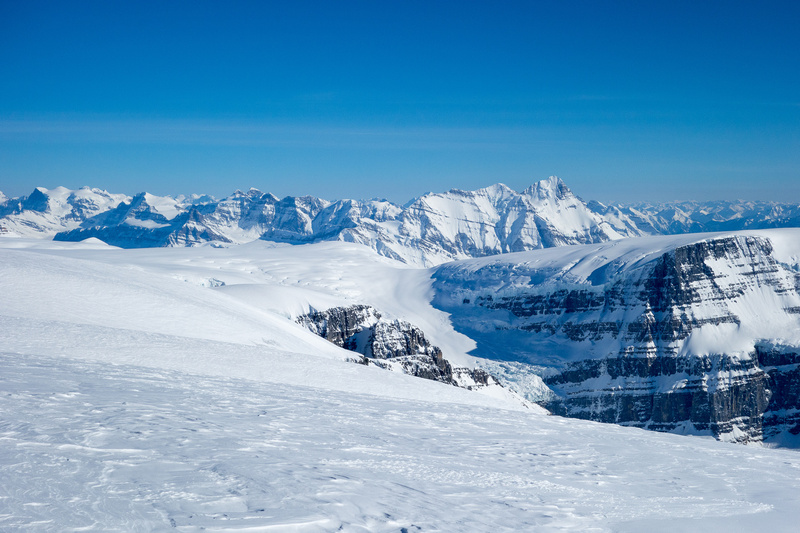 Difficulty Notes: Remote glacier camping and travel over many crevasses followed by a steep snow or low-angle ice climb to a spectacularly exposed ridge leading to the summit. I was feeling quite nervous at this point about the climb of South Twin. The reason? Ice. 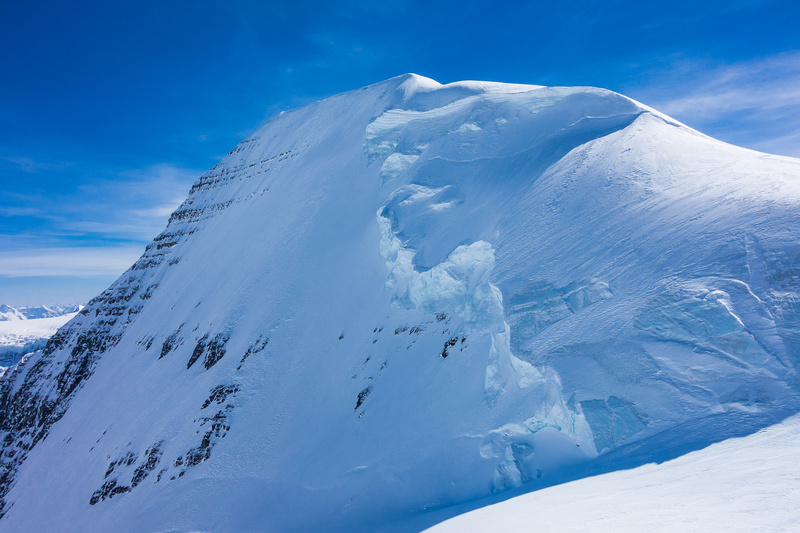 When we were descending North Twin to the col I noticed right away that there were no cornices on South Twin’s summit ridge. 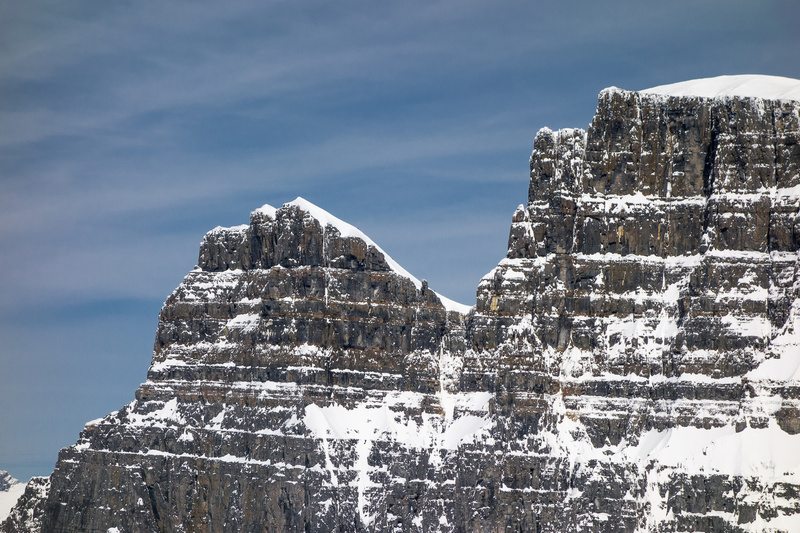 While this is a good thing (much easier ‘walk’ to the summit) it also means that there’s probably ice, instead of snow, on the north ridge which means you’d better have steel crampons and / or an ice ax in your pack. 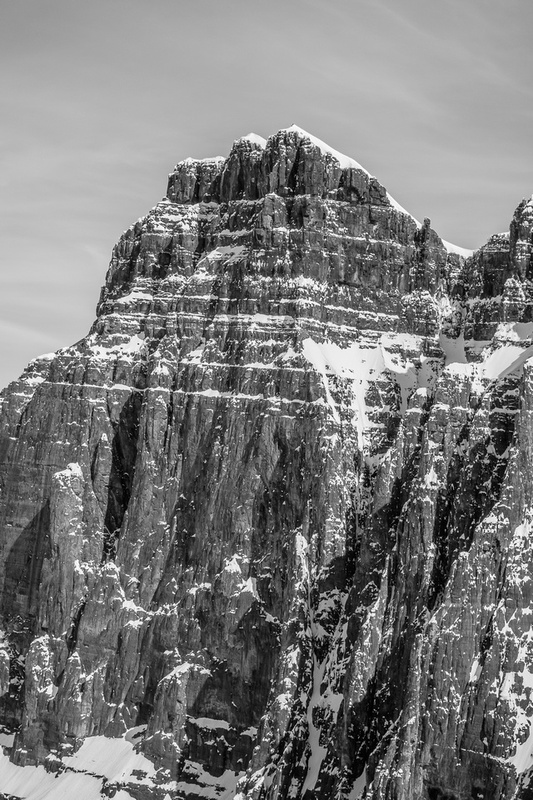 When prepping for the trip I knew that South Twin could be icy and packed my (heavy) steel crampons. In subsequent discussions with team members I realized some people were only bringing the much lighter aluminum crampons so I switched mine out. BIG MISTAKE! 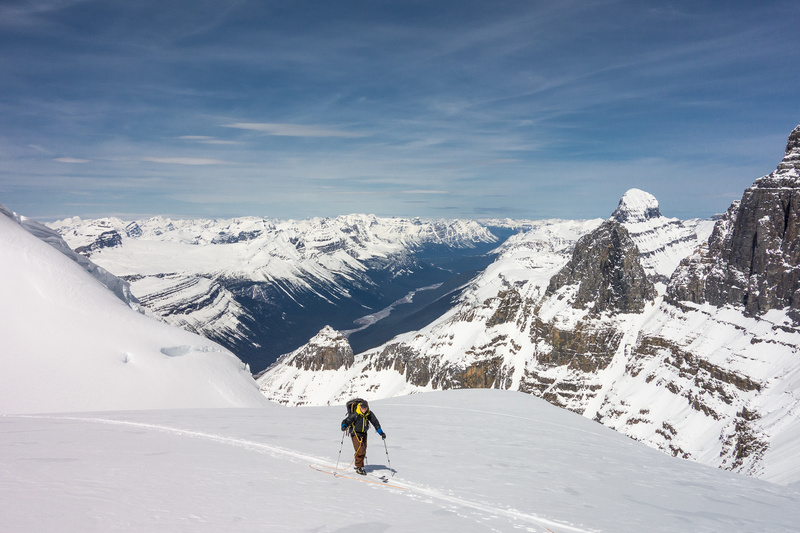 Skiing up the north ridge on South Twin. West Twin on the left and Alberta, Twins Tower and North Twin on the right. Our team eventually got tired of sitting in the hot sun and started our way slowly up the north ridge to the rocky area where the other team was just arriving. 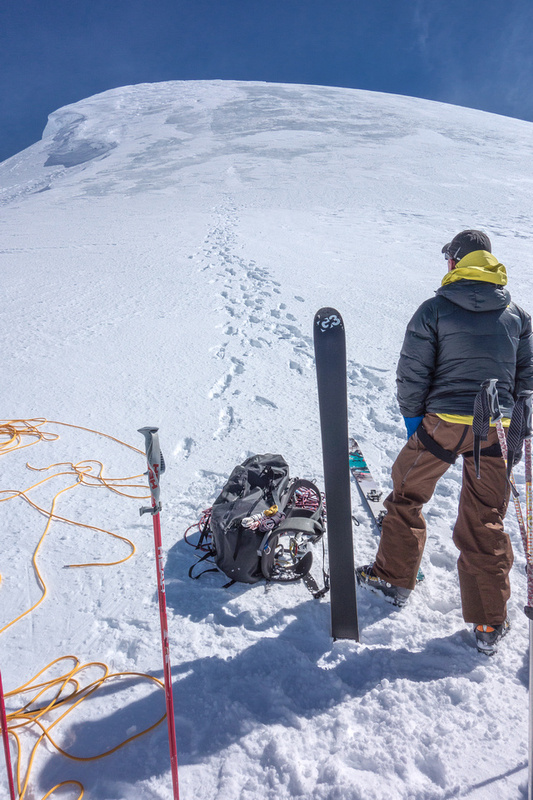 This area was where we planned to drop the skis, put on crampons and attempt to gain the summit ridge. 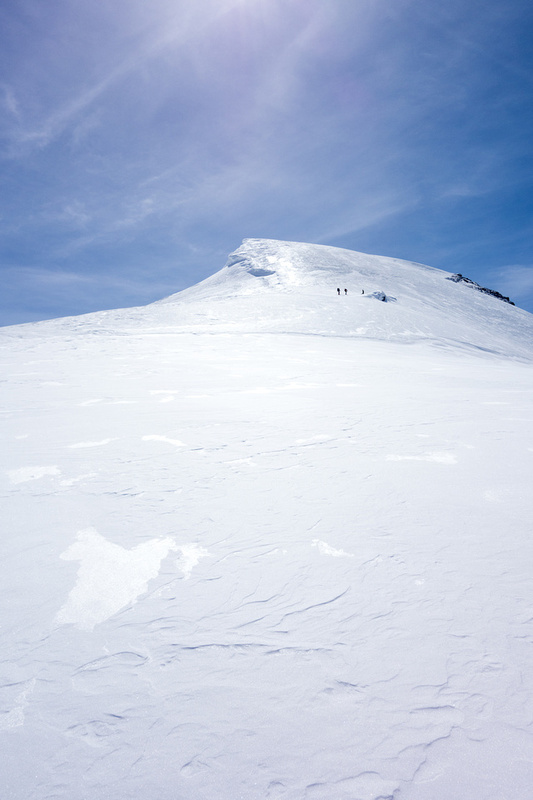 Above the ski drop area was a 60-100 meter section of 35-45 degree glacial ice that was our route to the summit ridge. 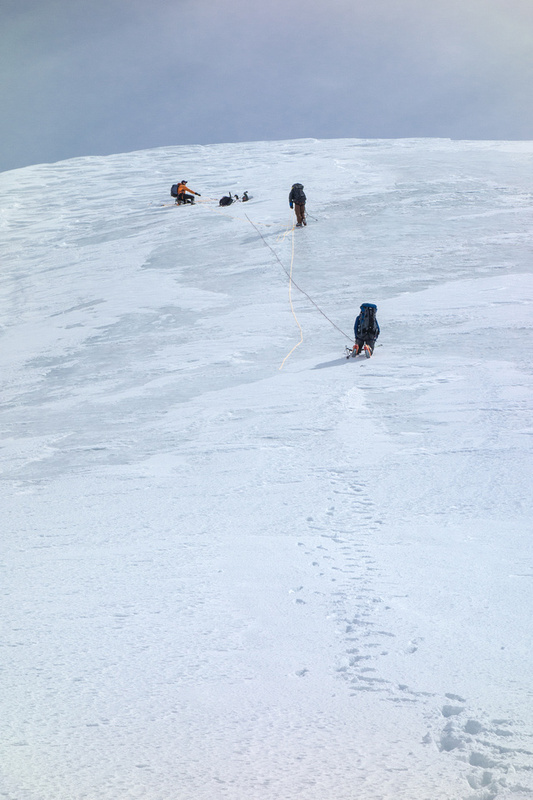 As we approached the rocky area we’d already crossed some smaller crevasses on the lower slope. Just before the drop area we crossed a BIG hole! JW pointed it out to me as we were crossing it and my heart almost stopped! 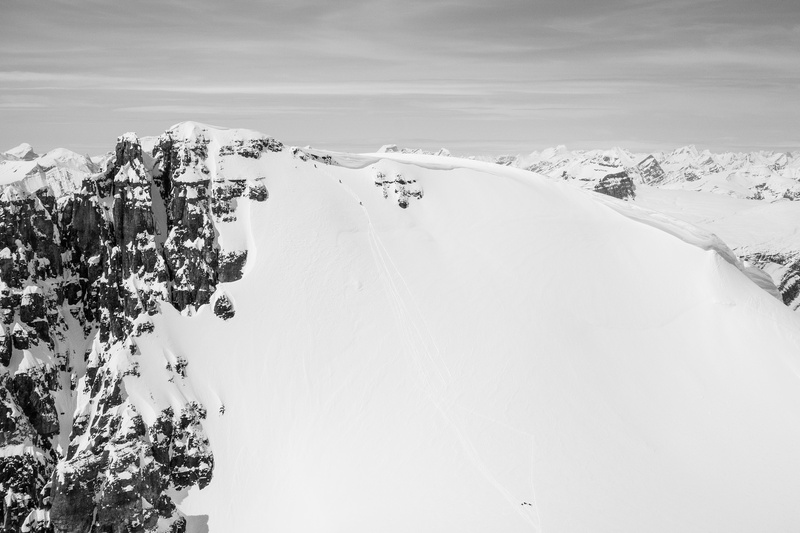 We skied over a thinner-than-we’d-like snow bridge to get across the gap and I’m telling you – it was huge, deep and scary. I didn’t like that bit – no one in our group did. Skis made the crossing just barely doable but on foot you’d have to find a way around it (probably on climber’s right). Many people have walked or skied over this crack in the glacier over the years and with lots of snow they wouldn’t even notice it. 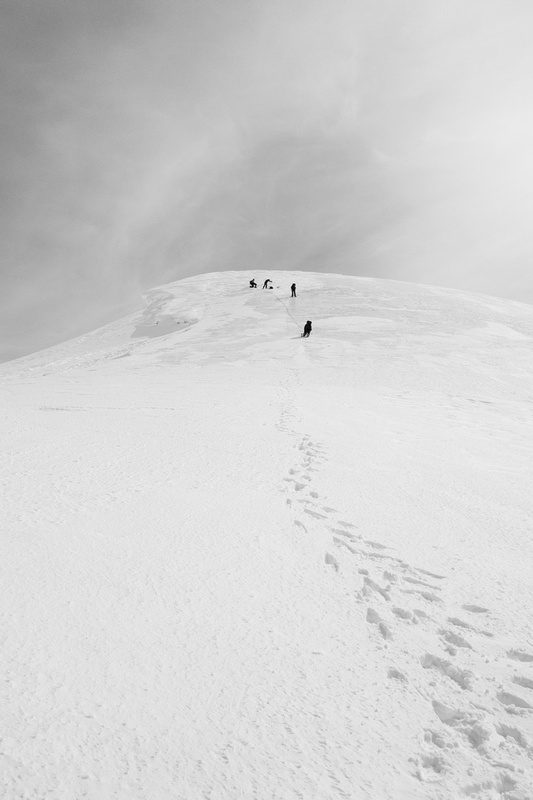 Another guided team approaches the summit ridge of West Twin in our tracks. As we gained the bench where we were dropping the skis I looked again at the ice bulge above. Anton was working his way expertly (he’s an ace ice climber) up it. I wasn’t at all sure this was for me. 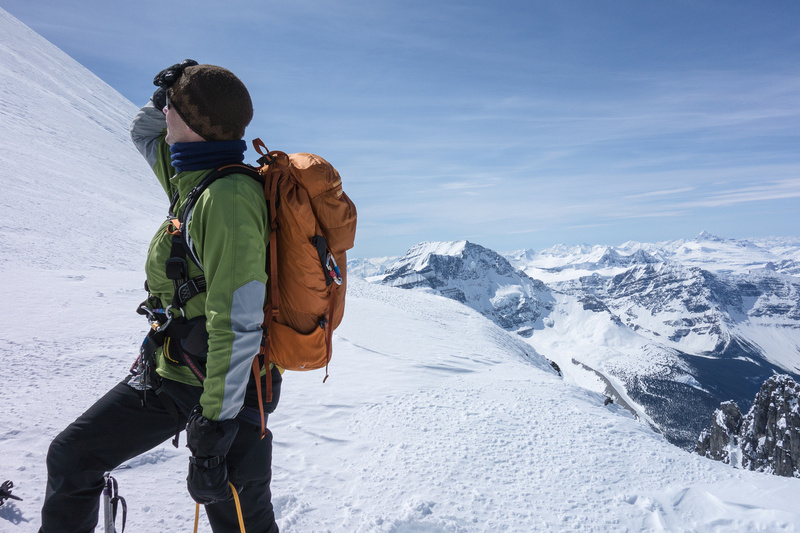 With my wimpy aluminum crampons and simply mountaineering ax I felt under-tooled for the job. JW and TJ assured me that they’d put in some running protection (ice screws) for me. I started to think maybe I could do it when it happened. TJ was looking up slope at Anton’s progress when he exclaimed; “I think Anton just fell into a crevasse”! Sure enough! Where Anton had been casually working his way up the slope only moments before, there was now just a thread of rope ending in nothing at all! Ian had caught the fall but the rope didn’t look too tight – indicating that possibly Anton wasn’t free-hanging in the hole – but he was definitely completely gone from the surface! The rope disappears into the hole that Anton has fallen into. The terrain. 35-40 degree ice. 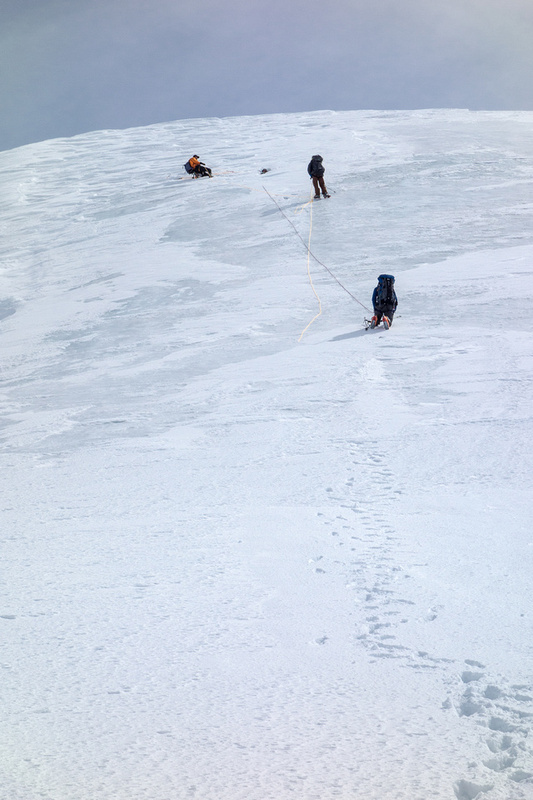 Very complicated to move around and don’t forget – there’s more crevasses lurking in the area. This was no ‘easy’ scenario where the team builds a t-slot anchor and then 3 or 4 guys heave on the rope and pull their buddy out and share a laugh after 30 minutes. 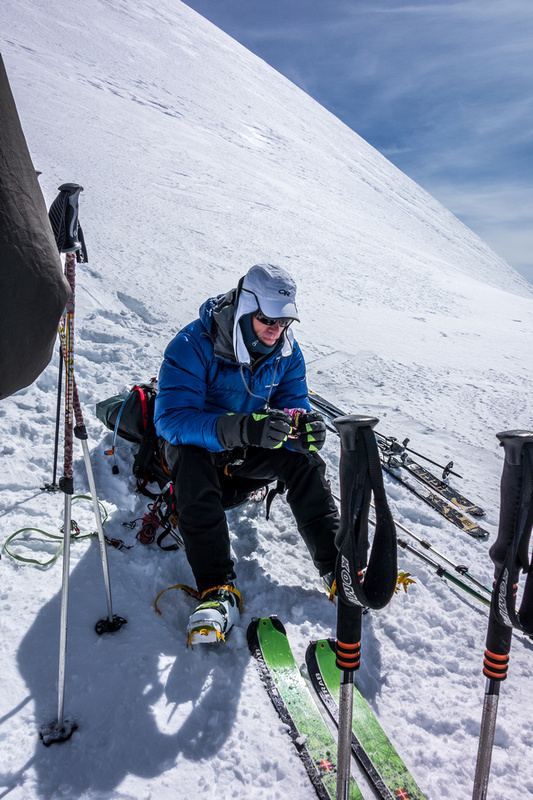 JW blew one of his crampons when his leg got ‘bit’ in the same slot that Anton fell in. He literally blew it apart and was operating on 40 degree ice with only one crampon!! The crevasse itself was weird. 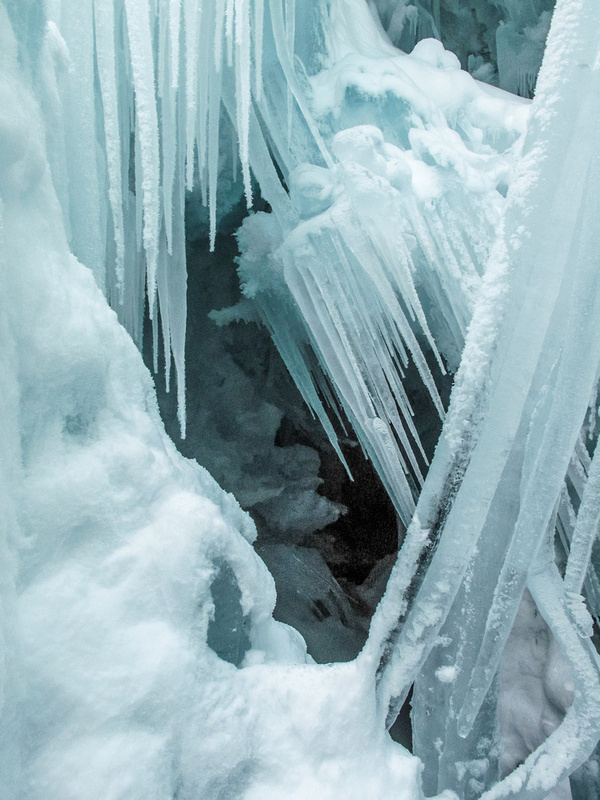 Most people think crevasses are simply an opening in the ice but those ones are easy to avoid (usually). 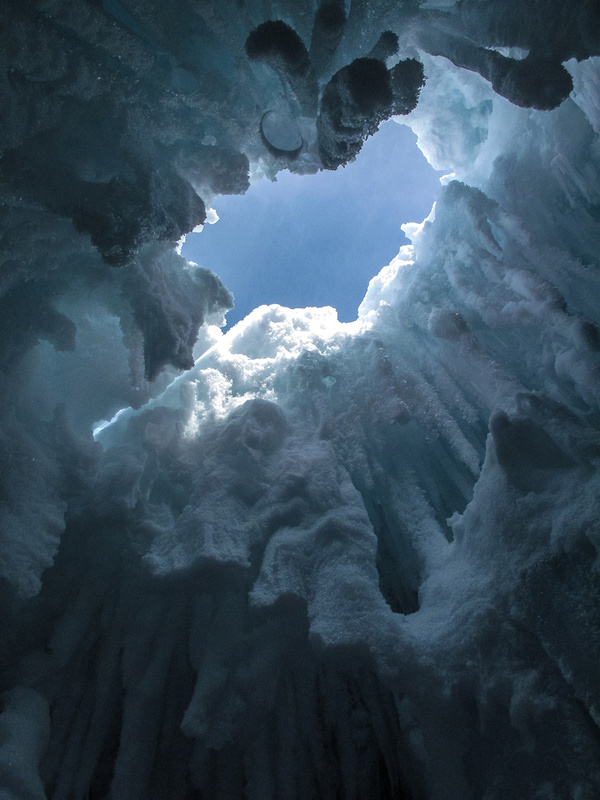 The one Anton was in was full of unconsolidated snow, huge hanging chunks of ice and simply no easy way out! The angle of rescue was weird too. JW had to pull Anton out sideways due to the terrain and the spot he fell in. 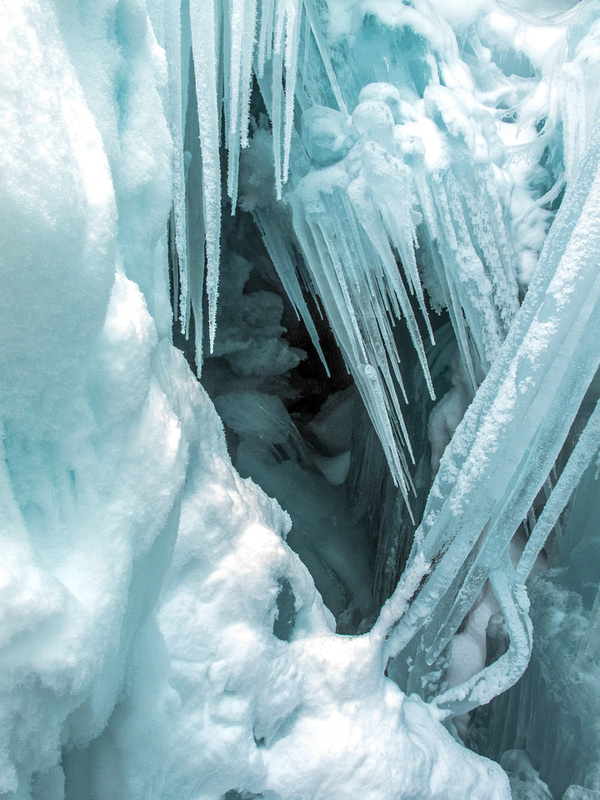 The rope was cutting so deeply into the lip that every time Anton tried to climb out he simply pulled more ice down on himself and the rope just cut into the snow even more. At first the situation was very tense. 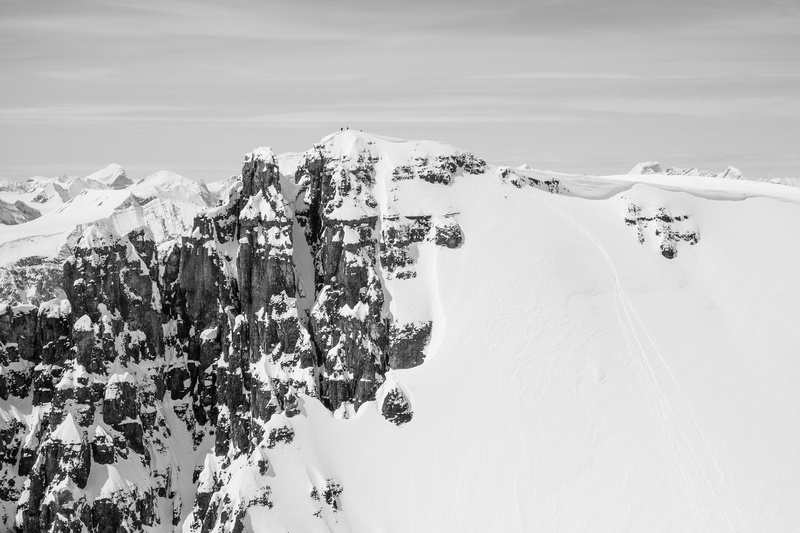 Due to the nature of the terrain / crevasse it wasn’t easy to get to the lip to see if Anton was OK. TJ and JW were yelling and getting only silence back. It was a long and tough half hour until finally JW could communicate with Anton and found out that he was basically OK but unable to rescue himself due to the nature of the crevasse. At one point, after building a nice anchor system to pull Anton out, JW had to completely disassemble the whole thing and delicately move to the other side of the slot due to the overhanging icicles in the hole that would have made the rescue too dangerous from the ‘obvious’ side! Anton’s icy prison view. No easy way outta this one! You really don’t want to fall into one of these holes without a rope on! After almost 2 hours of finagling around the hole and getting a good rescue system built up and trust me – this wasn’t because they were moving slow or didn’t know what they were doing – JW could finally haul Anton out of his icy prison with a nice 6:1 hauling system. PHEW!! We all whooped with joy at seeing Anton heave himself over the edge. After rapping down to Kev and I, he verified that he was a bit cold but otherwise 100% OK. The outcome could not have been better in the end. I know JW / TJ won’t necessarily agree but those guys are heroes. There is NO WAY that I could have done what they did. I would have had to initiate a warden rescue right away in that situation. 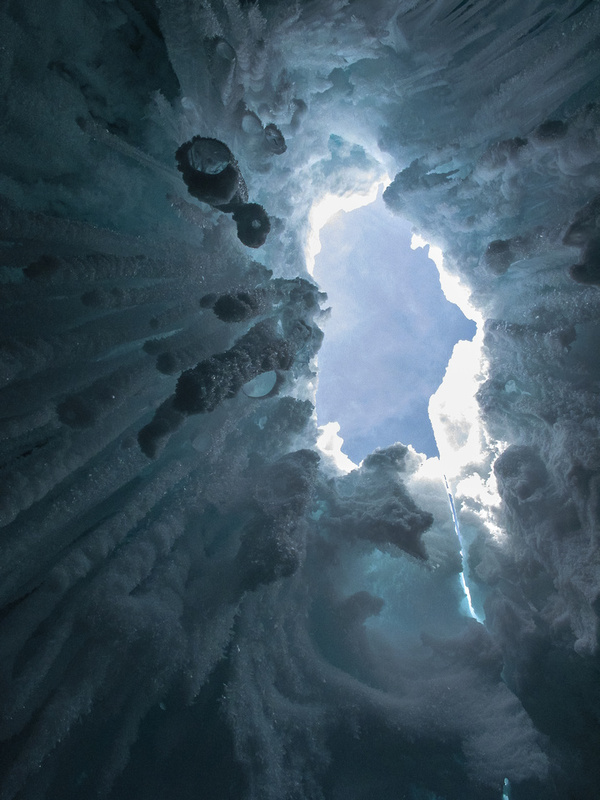 My ice skills and even crevasse rescue skills are only appropriate on ‘tame’ glacier situations – certainly not good enough for full on mountaineering terrain. If you think that the rescue could have been done quicker than 2 hrs, you’re fooling yourself. There’s no way. 2 hrs is an amazing time considering all the complications. I’m amazed by the amount of people wandering around the Columbia Icefields unroped or “lazy-roped” or with only two people on a rope. I have seen so many holes up there (and stepped in more than one of them!) 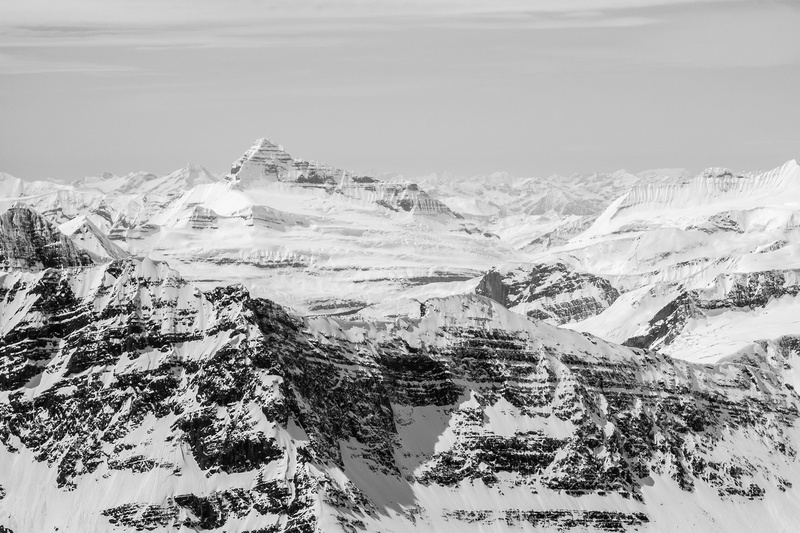 – on flat terrain, near summits, on steep slopes and on gentle slopes. 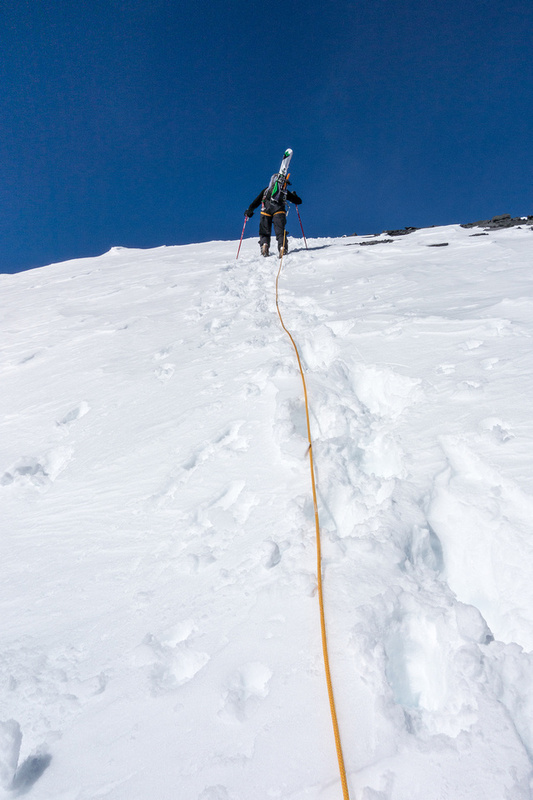 I can’t stress enough that if you aren’t 120% up to snuff on your crevasse rescue skillz, you should NOT BE UP THERE. PERIOD. I don’t care if you’re “only doing Snow Dome”. 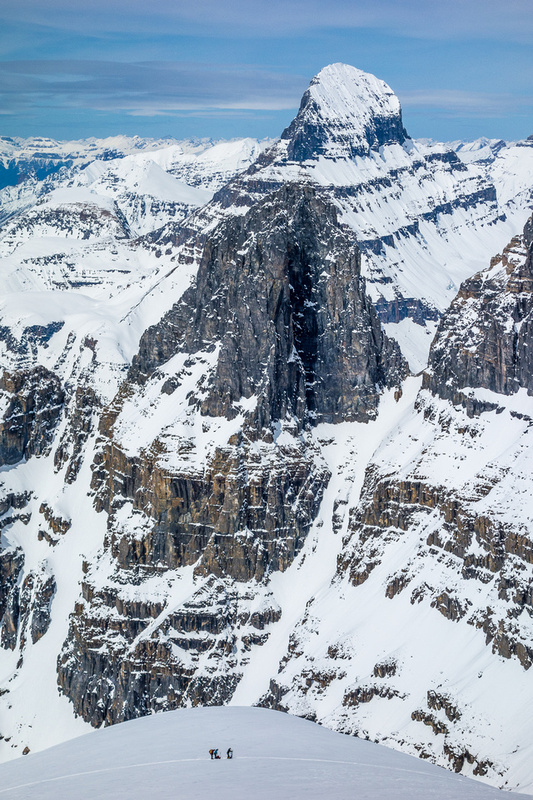 A guy fell into a slot on Snow Dome and died after being rescued – complicated by the nature of the crevasse, which was narrow and wedged him in. You can tell yourself that only people “off route” get into trouble but this is false. There are holes everywhere up there and you will step in one eventually if you’re up there enough – it’s just a matter of whether it’s an ankle-biter or you manage to yank back before falling completely in. Last year TJ went partially in a hole right at the summit of North Twin after 3 others walked over it without collapsing the bridge! Always travel with at least 3 people and do NOT COUNT on self-rescue working. 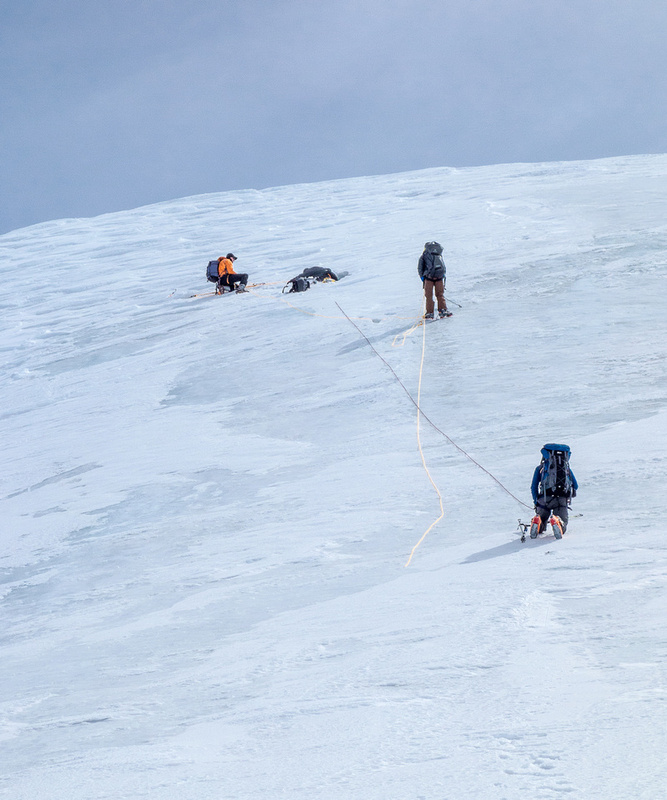 It’s almost impossible to self rescue in any real crevasse incident – this is verified by actual guides who train very hard on this skill and still find it difficult. Your partners HAVE to be able to build a Canadian drop loop 6:1 rescue haul in less than an hour under normal circumstances or you should rethink your partners. Travel with two groups of 3 if possible. 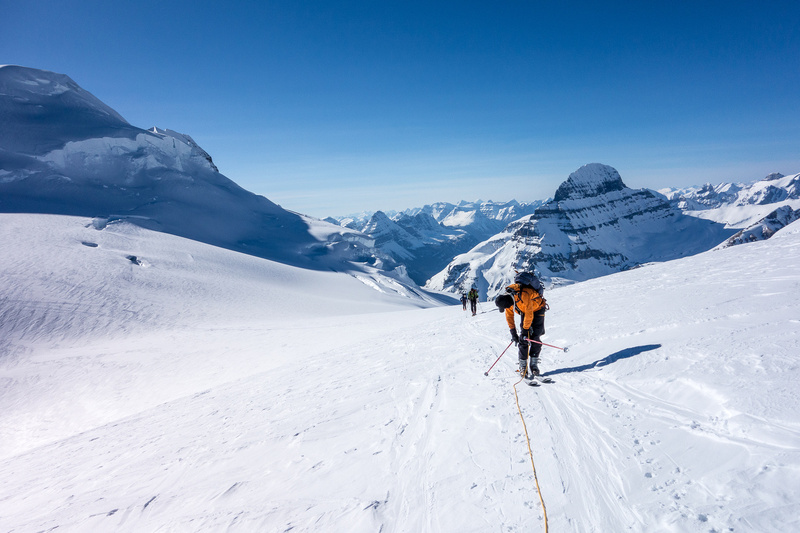 If not possible, carry an extra 30m rescue coil in the last pack on the rope and do not travel in groups of less than 3 on the main icefield. It’s very easy to RUN OUT of rope in a real rescue situation. Anton’s head comes out of the crevasse as JW pulls him out with a 6:1 pulley rigged system. Helen’s team is tiny beneath us. Son of a Twin and Alberta rising above them here. By the time the rescue was complete, nobody felt like continuing up South Twin. Daylight was going to be an issue since it was already 15:00 and at least 3 hours back to camp. 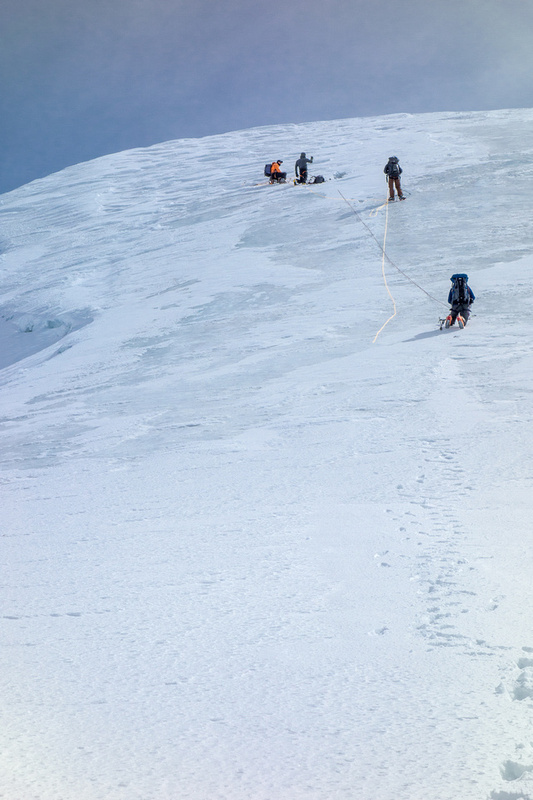 JW had a busted crampon and Anton was starting to realize what he’d just been through. Unfortunately we were going to have to come back yet again for South Twin Peak! JW ascends North Twin with South Twin at right. The ski back to camp was long. We used the tracks of the team who followed us up West Twin (Helen was the guide) around the south flank of North Twin on the lower bench that we should have taken in the morning. This bench route saves hundreds of meters of elevation gain / loss but it does traverse some very steep slopes which could impose avalanche risks in the right conditions. 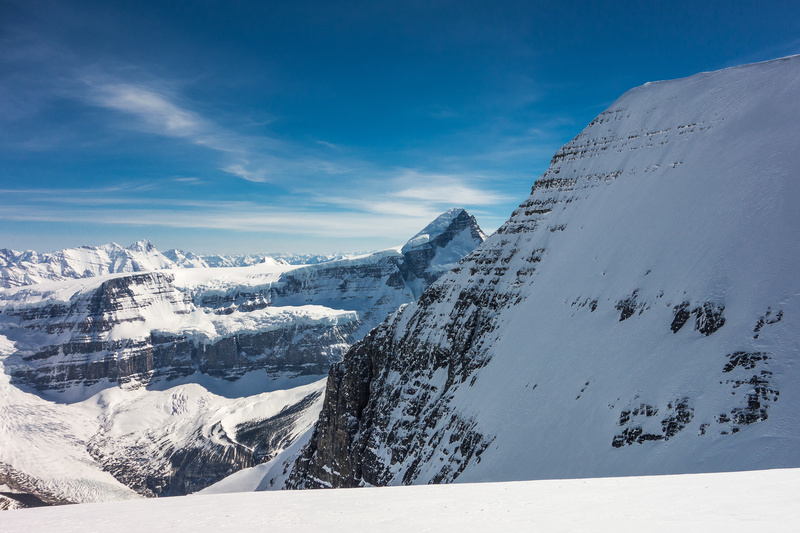 These slopes are on the southwest side, closest to the South / North Twin col and could be avoided by simply heading straight up North Twin and up and around them. Of course you have to evaluate these slopes depending on the conditions when you’re on them. 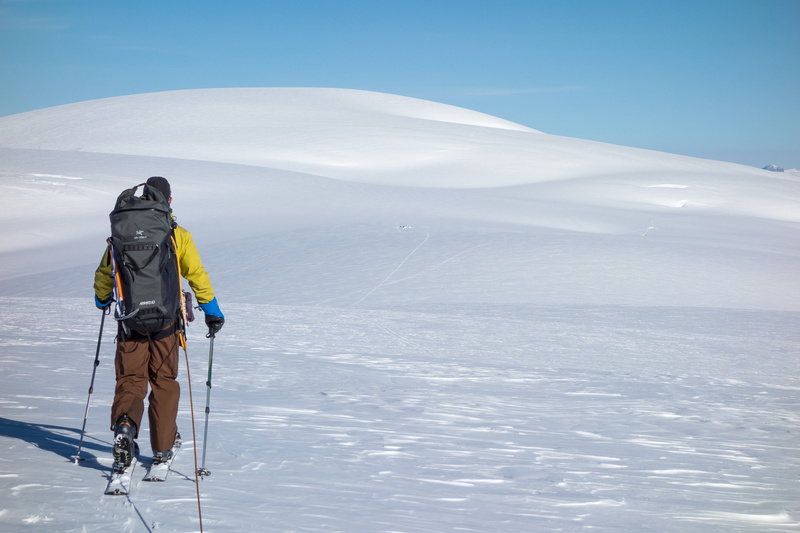 Ski crampons are almost a must here – you will not feel secure on hard pack snow with just skins on. We arrived back at camp around 19:00 and it felt great to sit, relax in the warm evening temps and reflect on a very interesting day. 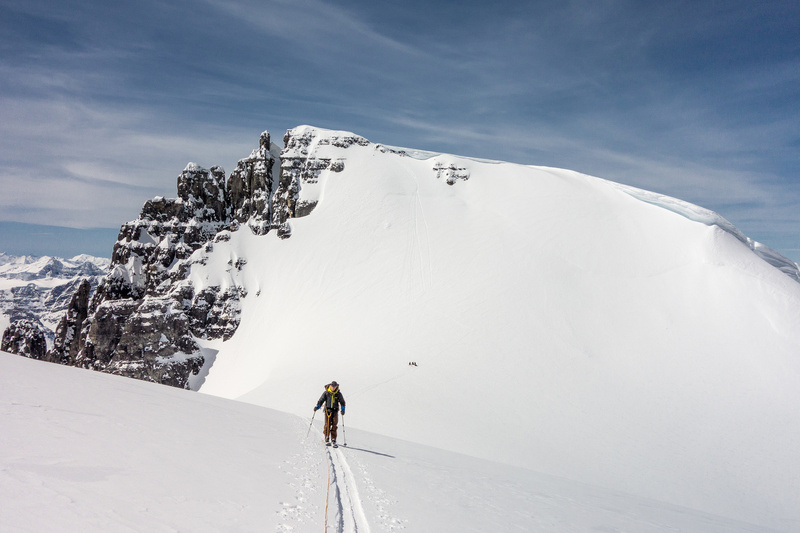 Skiing up the north ridge on South Twin. 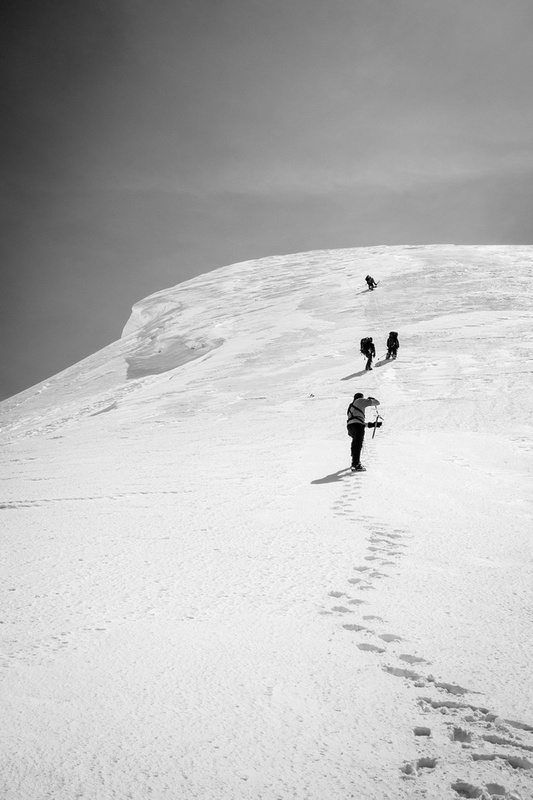 Looking up at the other team as they ditch their skis and prepare for the final ascent on foot. The terrain is much steeper than it appears here. Trying to see what happened up slope. TJ and JW work on setting up a crevasse rescue high on South Twins north ridge. At this point we still had no idea if Anton was OK or not. JW sets up an anchor. I love Tsar Mountain's profile! On the right side of the hole, JW is now ready to haul on the 6:1 rescue system he built. On a 40 degree ice slope. 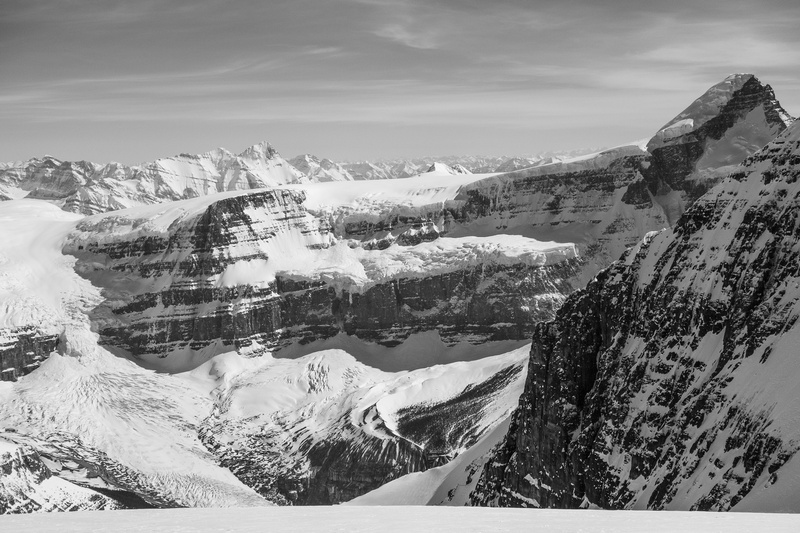 Looking north past Mount Alberta. Anton's icy prison. Note the huge icicles and the incredible amount of 'digging in' the rope did! Helen's team sits below South Twin. Anton fuels up and contemplates his ordeal. Packing up the skis to climb part way up North Twin's ridge. 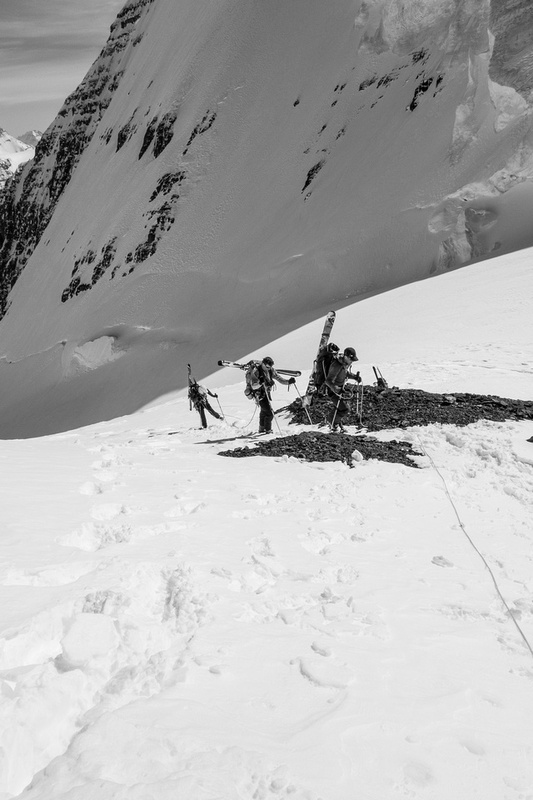 The team works it's way part way up the southwest ridge on North Twin. Steep slopes back up North Twin. The skis aren't light either. Looking back at TJ and the South / North col after we're off the steep slopes. 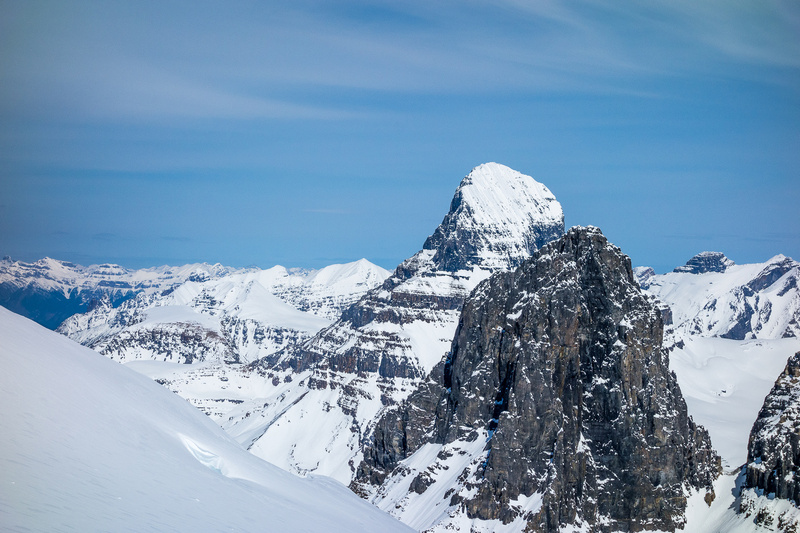 Believe it or not - Trevor Sexsmith skied the slope at right - off of South Twin. The deep hole between the Twins and Mount Columbia that holds Columbia Lake and is known as "The Trench". 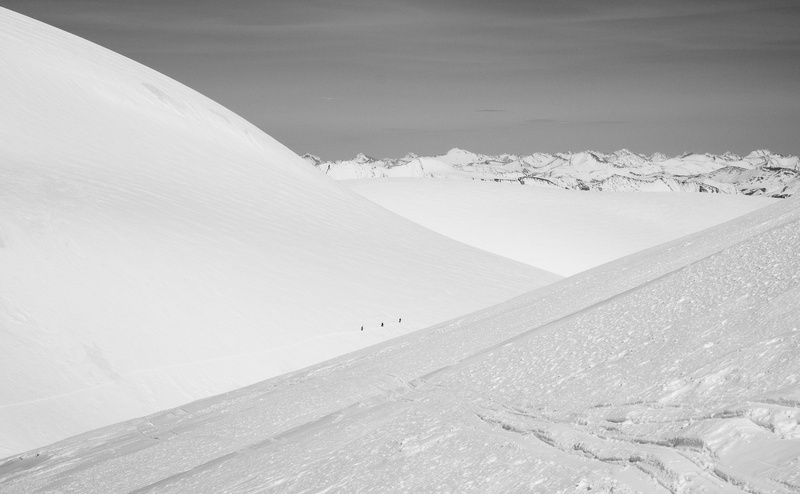 Off the traverse, looking back along North Twin to the other ski team. The route we'll take next time goes UNDER the shadowed roll and ABOVE the hole just under South Twins ridge line. Twins Tower doesn't look so 'small' from this angle! 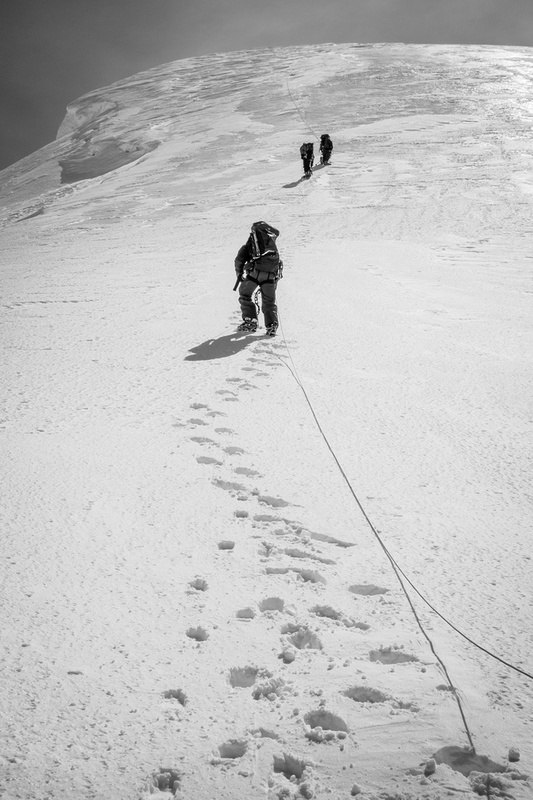 There are climber's right on its summit. Helen's team on the summit of West Twin. The terrain is huge here. The rope disappears with Anton out of sight! I see Anton's head! The glacier 'gives birth' to Anton as JW pulls him back from the dark. 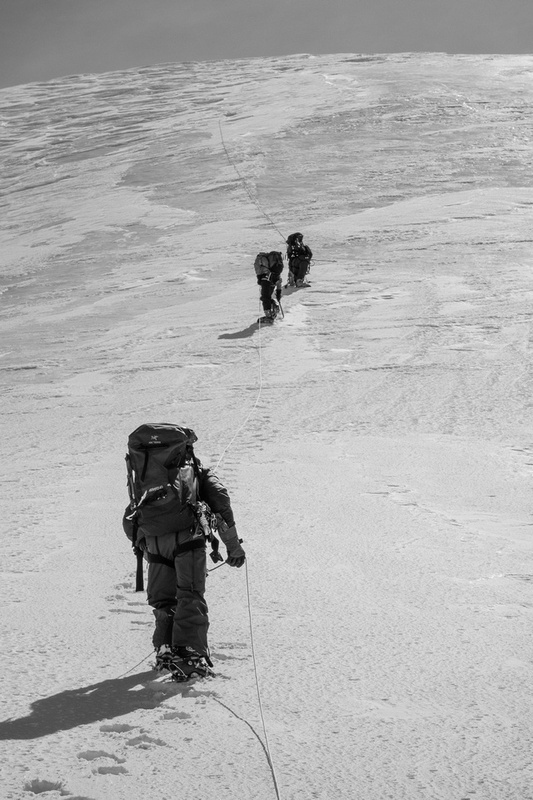 Off the steep slopes, now we just have to slog back to camp and avoid all other crevasses!